The back-up alarm has a potted circuit board. It is surface mounted and has stud connections. Flush Mount alarm fits into any 4" stop/tail/turn light hole. Standard grommets & pigtail complete the low profile installation. Put the sound where it is needed - at the rear bumper and out of the mud. Automatically adjusts to 10 decibels above surrounding noise level. Reduces irritation for workers. Universal mounting. UL listed for electric vehicles. 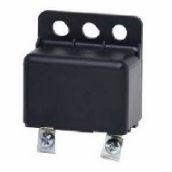 When it isn't possible to wire back-up alarms directly to vehicle back-up light circuit. Install adjacent to gear shift lever or linkage. Switch activates alarm when the shaft is moved. The universal buzzer, can be used for 'door ajar' warning, bus driver alert, low air pressure warning, temperature warning and several more uses.